Minimum of 30% more than convention fiberglass batt insulation. 10 times more air tight when compared to a fiberglass insulated home wrapped with a vapour barrier. Exceeds coming and existing energy code changes requiring higher performance. Build with SIPs, build for the future! Increasing thermal performance by 30% and airtightness performance by 10 times, SIP Insulated Panels are incomparable to conventional building methods. When skilled labour is at a premium Structural Insulated Panels allow inexperienced crews to shave days off building enclosure schedules. IPB Insulated Wall Panel Exceeds Requirements of Recent B.C. Building Code Changes. Structural Insulated Panels have the Highest Life Cycle Benefits of all construction materials. The construction and operation of buildings have a significant impact on the environment. Buildings account for 39% of total energy consumption and 38% of carbon dioxide emissions in North America. Green buildings use less energy, reducing carbon dioxide emissions and playing an important role in combating global climate change. Buildings also use a tremendous amount of natural resources to construct and operate. Constructing green buildings that use these resources more efficiently, while minimizing pollution that can harm renewable natural resources, is crucial to a sustainable future. Structural insulated panels (SIPs) are one of the most airtight and well insulated building systems available, making them an inherently green product. SIP buildings use less energy to heat and cool because of their high performance insulation ans superior air tightness. This attributes also mean for better control over indoor environmental conditions provides a warm cozy interior. SIPs also reduce construction waste another sustainability negative of wood framing, 11 to 17 percent of wood purchased for conventional construction is burned or ends up in a land fill. SIP waste at the construction site is minimal and factory waste is recycled. Building with Structural Insulated Panels create a superior building envelope with high thermal resistance and minimal air infiltration. 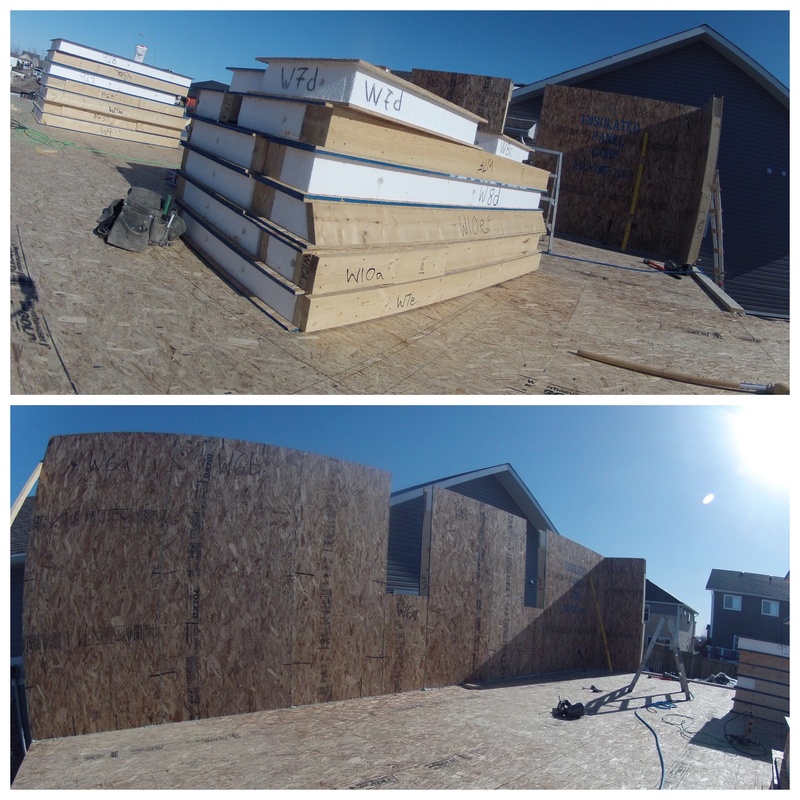 Studies and experience show that a standard 6 ½” SIP wall rated at R-27 considerably outperforms a 2 X 6 stick framed wall with R-24 fiberglass insulation. EnerGuide home audits demonstrate that the airtightness of a SIP house in Canada is at minimum 10 times more air tight than a conventionally built house. A blower door test done by the Oak Ridge Laboratory (ORNL) in the U.S. revealed that a SIP test room is 15 times more airtight than its stick framed counterpart with fiberglass insulation. The major components of SIPs, EPS rigid foam and oriented strand board (OSB), take less energy and raw materials to produce than other structural building systems. SIPs are also fabricated in a controlled environment, allowing for greater efficiency than site-built framing. The U.S. based National Home Builders Association (NAHB) estimates that the construction of a 2000 sq. ft. home produces 7,000 lbs. of waste. SIPs have the ability to drastically reduce the waste generated during construction, by using advanced optimization software and automated fabrication technology to ensure the most efficient use of material. OSB is manufactured from fast growing, underutilized, and often less expensive wood species grown in carefully managed forests. The OSB production process uses small wood chips and highly automated machinery, making OSB a very efficient use of raw materials. About 85-90 percent of a log can be used to make high quality structural panels, and the remainder – bark, saw trim, and sawdust – can be converted into energy, pulp chips or bark dust. EPS is a lightweight insulation composed mostly of air. Only 2% of EPS is plastic. Over the lifetime of a house, the EPS insulation used in SIPs will save many times the energy embodied in the petroleum used to make EPS (see Life Cycle Analysis for more info). Scrap EPS generated during the manufacturing process can be recycled into new EPS products. A SIP home or commercial building allows for better control over indoor air quality because the airtight building envelope limits incoming air to controlled ventilation. Controlled ventilation filters out contaminants and allergens and also allows for incoming air to be dehumidified, reducing the possibility for mold growth. New building codes require advanced ventilation equipment be installed that provides fresh air to airtight homes. SIP buildings compliment these systems perfectly. SIPs do not contain any VOCs or other harmful chemicals that can affect occupant health. The components used to make SIPs (foam, oriented strand board, and adhesive) meet some of the most stringent standards for indoor air quality. EPS does not off gass after it is manufactured and uses pentane, a non-CFC blowing agent that dissipates shortly after production. SIP homes have qualified under the American Lung Association’s Health House® indoor air quality standard. Structural adhesives used in SIP production are water activated and do not contain any measurable amounts of volatile organic compounds (VOCs) that can be harmful to occupants. Oriented strand board (OSB) does not contain urea formaldehyde adhesives and meets the world’s leading formaldehyde emissions standards, including the U.S. HUD Manufactured Housing Standard, the California Air Resources Board (CARB) Air Toxic Control Measure for Composite Wood Products and the European EN-300 Standard. There is no related waste at the job site, it stays at the plant. Speed up your project completion time by 50% or more. Increase the building’s energy efficiency by at least 30%. 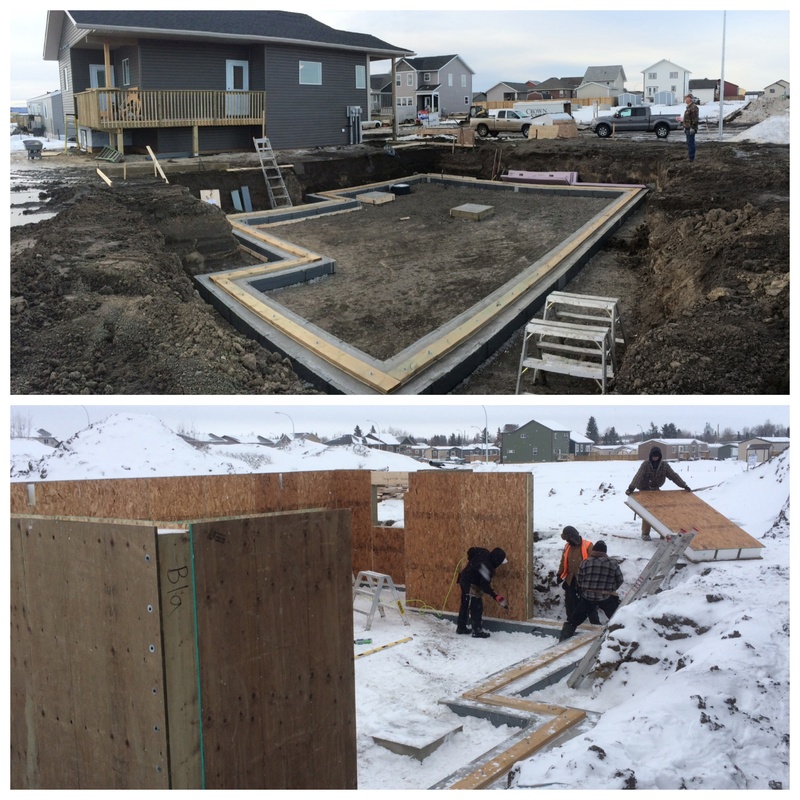 When skilled labour is at a premium structural insulated panels allow experienced or inexperienced crews to put up building envelopes in just a few hours, shaving days off building enclosure schedules. Every IPB Product is fabricated in our plant and is delivered to the building site ready for installation. Exceeds NEW Building Code 9.36 energy code requirements. Excess RSI allows for trade off in building design. CCMC approved wall panels do not require engineering for 6 1/2″ walls 10′ or less. Speeds up completions, up to 50% quicker. Add more projects to scheduled builds. Fully insulated SIP enclosure makes winter finishing quicker, comfortable and less expensive, with less hassle. Panels are delivered ready to stand. Experience is not required. Design flexibility and versatility, complicated site construction issues with arches, angles and designs are eliminated by IPB factory prefabrication in the plant. Reduced labour associated with waste. Reduced costs for hauling and tipping.